I love historical romance, I love the Victorian period. I've read quite a bit about Jack the Ripper. When I started reading this book, I was immediately thrown off by having a 48 year-old woman as my heroine. I don't know why I have resistance to reading about older main characters - personal preference, I guess. As it turned out, I found Vicky not only very relatable (for an Empress...) but rather endearing. It's been almost a year since her husband passed away, and Vicky's lonely and lacking a purpose. She's given herself up to the mourning process - something her mother, Queen Victoria, was notoriously proficient at in the wake of Prince Albert's death. When her niece, Maud, asks her to come aid the Royal Family in heading off rumors about Eddy, the Crown Prince, and his involvement in the brutal murders of prostitues in London's Whitechapel, Vicky is given a new lease on life. She's earnest, self-deprecating, kind. She yearns for companionship, and she's got a pretty strong backbone too. Thomas, the detective investigator handling the Ripper case, is also pretty awesome. He's completely focused on his work, putting in long hours and foregoing sleep to see justice done. He's considerate of Vicky and completely in awe of her and I loved that about him. I wasn't as interested in Vicky's daughter and niece and their escapades. I think I needed a little bit more to wrap them up or... something? I don't know. I liked that this book was conscious of class issues, that some of the characters were unabashedly class-ist, as they would have been in reality. The interplay between Thomas and Vicky was also tinged by this and the differences between them made their attraction a little heartbreaking. I was surprised by how much I enjoyed it even knowing that Vicky had to return to her life in Germany. The handling of the Ripper murders was also interesting - the role of the newspapers in whipping up public concern was particularly well handled. Overall, I was pretty impressed with the historical aspects of the story. Yes, liberties are taken - I cannot envision members of the Royal Family running around trying to solve murders for any reason - but that's kind of the fun of the story. 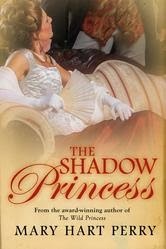 The Shadow Princess is an enjoyable romp through Victorian London. There's attraction across classes, there's princesses pushing at the rules that confine them, there's a murder mystery! I recommend this one if you like historical romance and/or mysteries. There's enough of either element to satisfy, I think.